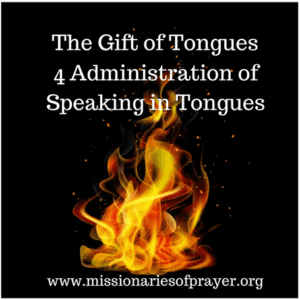 Did you know that there are 4 different administrations of the gift of tongues? Most churches speak on one type of speaking in tongues and they talk about it from their doctrinal point of view instead of teaching on the 4 types. This leads to a lot of confusion in the church. We hope that by the end of this post you will have further clarity on this gift. First, the 4 administration of the gift is broken down into 2 for public use and 2 for private. We see this type of tongue used in Acts 2 after the Holy Spirit came upon the disciples. They were in essence speaking in 10 different languages. They didn’t understand those languages and neither do they speak those languages but the Holy Spirit gave them the ability to speak these different languages so they could preach the Gospel and see 5,000 people come to know Christ. So this would be people who only speak Hebrew suddenly speaking Arabic, Mandarin Chinese, Italian, etc. Acts 2 English Standard Version (ESV) “2 When the day of Pentecost arrived, they were all together in one place. 2 And suddenly there came from heaven a sound like a mighty rushing wind, and it filled the entire house where they were sitting. 3 And divided tongues as of fire appeared to them and rested on each one of them. 4 And they were all filled with the Holy Spirit and began to speak in other tongues as the Spirit gave them utterance. Here’s a question for you? Have you ever spoken in tongues and it was a known language? If you have not, then you have not been used by the Holy Spirit to administer this gift of tongues…yet. This administration of the gift is the one we generally see used in Pentecostal churches. When this gift is properly administered there must be someone to interpret the tongues. If there is no interpretation it is out of order and should be viewed as not coming from the Holy Spirit. Notice it is interpretation of the tongue and not an exact translation. Notice that this administration of the gift needs interpretation while the first one in Acts 2 didn’t because they were speaking known languages. So this is clearly not the same thing. We see from these scriptures that this is a gift that is given to some believers and not to others because God gives as He determines. Do you know that there are people who interpret tongues but don’t speak in tongues? There are also those who have both gifts, they speak in tongues and they interpret tongues. They can even interpret their own tongues. Romans 12: 27 Now you are the body of Christ, and each one of you is a part of it. 28 And God has placed in the church first of all apostles, second prophets, third teachers, then miracles, then gifts of healing, of helping, of guidance, and of different kinds of tongues. 29 Are all apostles? Are all prophets? Are all teachers? Do all work miracles? 30 Do all have gifts of healing? Do all speak in tongues? Do all interpret? 31 Now eagerly desire the greater gifts. The answer to the question is No. So, not everyone has the gift of tongues and not everyone can interpret tongues. 1 Corinthians 13: 1 New International Version (NIV) “If I speak in the tongues of men or of angels, but do not have love, I am only a resounding gong or a clanging cymbal. So this scripture says that we have tongues that we speak to men (a known tongue) and a tongues that is used to speak to angels (unknown tongue). It makes sense that since there are different languages here on earth then there must be other languages spoken in heaven as well. What language do the angels speak? Since there are different classifications of angels there is a possibility that the different angels also speak different languages. Also, do angels that have assignments over different regions speak different tongues? This is speculation but it is possible. This is the tongues that builds your own spirit. This is done in private, or sometimes under your breath when you are in a prayer meeting praying with others. It is not for the benefit of others but for yourself and in communicating with God. 1 Corinthians 14 New International Version (NIV) “ 2 For anyone who speaks in a tongue does not speak to people but to God. Indeed, no one understands them; they utter mysteries by the Spirit. So based on this scripture we see that this tongues is not like the others that were mentioned before because this is a tongue that speaks directly to God. It is not for the benefit of others and there is no interpretation needed. “4 Anyone who speaks in a tongue edifies themselves, but the one who prophesies edifies the church. 5 I would like every one of you to speak in tongues, but I would rather have you prophesy. The one who prophesies is greater than the one who speaks in tongues, unless someone interprets, so that the church may be edified. 6 Now, brothers and sisters, if I come to you and speak in tongues, what good will I be to you, unless I bring you some revelation or knowledge or prophecy or word of instruction? 7 Even in the case of lifeless things that make sounds, such as the pipe or harp, how will anyone know what tune is being played unless there is a distinction in the notes? 8 Again, if the trumpet does not sound a clear call, who will get ready for battle? 9 So it is with you. Unless you speak intelligible words with your tongue, how will anyone know what you are saying? You will just be speaking into the air. 10 Undoubtedly there are all sorts of languages in the world, yet none of them is without meaning. 11 If then I do not grasp the meaning of what someone is saying, I am a foreigner to the speaker, and the speaker is a foreigner to me. 12 So it is with you. Since you are eager for gifts of the Spirit, try to excel in those that build up the church. From these scriptures we see that there are tongues to edify oneself, tongues that need to be interpreted. We also see that we should not forbid anyone from speaking in tongues. Understanding that there are 4 different administration of this gift brings further clarity to the scripture 1 Corinthians 14. Otherwise, it would seem that one verse contradicts the other. #1 If you don’t speak in tongues you are not saved and this is the scripture that is used to support that point…. Following that doctrine it means that all of these same people would need to pass the “snake test” and the “poison test” and the “healing test” as well. I’m pretty sure they will fail one of these. You do not need to speak in tongues to be saved. You can be saved and not speak in tongues. Since we now know that when you speak in tongues you could be speaking to angels then it is safe to say that some who are speaking in tongues could also be speaking to demons. Yes, this is true. However, not everyone who speaks in tongues are conversing with demons. Many times in churches when it is preached that you must be saved to speak in tongues people feel pressured into speaking in tongues and end up tapping into something demonic. Or hooking up with those practicing witchcraft and then tap into demonic tongues. Those who have the gift of discerning of spirits can tell when the tongues are “unclean” and something is not right about the tongues. If you feel like you may be a part of a group where there are demonic tongues you just need to stop speaking in tongues around them and find another group. Pray that God would cleanse you from these unclean spirits and purify your tongues. #3 This is a gift given by the Holy Spirit and therefore cannot be turned on and off like a light switch. The answer is YES and NO. Obviously if you are administering this gift in public (points #1 and #2) then you are totally not in control as to when the Holy Spirit starts using you in this gift. You would have absolutely no control over it. However, if you are administering this gift in private (#3 and #4 scenarios) you determine when and how long you speak in tongues. When you are alone in your house speaking in tongues to edify your own spirit you do start this by yourself. You can actually practice by starting out praying in tongues for a minute to 5 minutes per day. It will feel and sound strange at first but as you go along and increase the time you will suddenly start to receive revelation from God, new giftings you never had before and an understanding of things in the spiritual realm you never had before – directly from God. After awhile you’ll be able to speak in tongues for 1 hour everyday in private. This is a really good way to build your own spirit, especially if you are in an intense spiritual battle. When you are doing this alone at your home then you don’t need to be concerned with how it sounds. If you practice on your own then you build your confidence and your spirit and when you are in public you are more likely to be the person God uses to administer the gift in #1 and #2. Hope this makes sense. Before you think I’m crazy for even suggesting this, pay attention to what Paul is saying in 1 Corinthians 14:18 I thank God that I speak in tongues more than all of you. 19 But in the church I would rather speak five intelligible words to instruct others than ten thousand words in a tongue. He says he speaks in tongues more than any other person, but in church he would rather speak a known tongue…. This means he’s speaking in tongues more than anyone else in PRIVATE. You can do this at home alone to build up your spirit. This completely explains why Paul was able to go through what he did and remain strong. When you start to speak in tongues for an hour or more per day your spirit takes dominance over your flesh and you are able to walk and move in the supernatural. Try it! Here’s hoping that if you read all of this you have a better understanding of this gift. You can let us know your thoughts in the comments below. Prophetic Word for September 2017 - 40 Days of Favor! This post was so so enlightening. Thank you so much for taking the time to write it. My journey has been a long one as I was raised to believe speaking in tongues was demon possession or just the ability to speak another earthly language. I have come a long way in my understanding since then and came to a time in my life where I was desperate for The Spirit to pray into things I didn’t fully understand and situations that were so complicated. I begged the Lord for the gift of tongues and within 2 weeks (and the most incredible story) God released this gift in me. It was such an incredible experience. My question – is it appropriate to use the gift of tongues when praying with my husband if neither of us have the gift of interpretation? Also would it be appropriate to pray quietly with someone using known and unknown language – to speak into private problems or while crying out for healing etc? Thank you so much and God bless you over and over for the many teachings. Regarding the Holy Spirit, my cries and prayers has been to get to know our precious Holy Spirit more and more intimately and deeply. And here you have been brought to me! How very blessed I am! Please pray for me that I am blessed with whatever gifts our Holy Spirit chooses to anoint me with. I have been praying deeply for the gift of prophesy. That said, I am willing to receive whatever our Abba-Father believes I am ready for. Humbled in heart, mind, spirit and body. I thank you so much for the light you have giving me ,i really thought it was just one speaking in tongues. Now that i know i will take the teaching to our fellowship and let them also get the understanding, i also speak in tongues and understand everything i am saying but when i tell someone, it will be strange to the person. So how can i also understand when some else is speaking in tongues? I only know it is coming from God when i feel the His presence when someone is speaking in tongues. Thanks for the teachings on the Holy Spirit,so enlightening. I’ve believed for years now and I’m yet to speak in any form of tongues. This is my aspirations this year. How do I move up higher this plane. iam blessed, i never knew their environment of miracles,i can be happy if can be sending me this kind of posts. Great post also! This clearly explains what we are all thinking but could not state so wisely. Thank you for your commitment and help! God Bless you and your work!